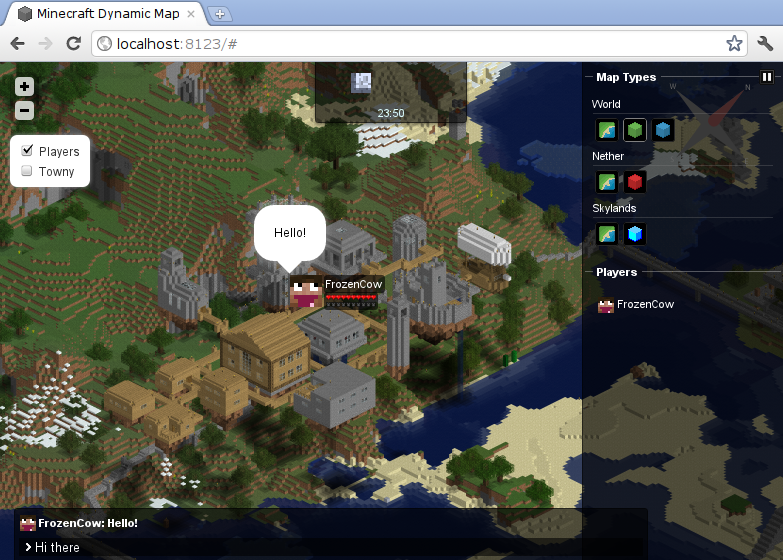 A Google Maps-like map for your Minecraft server that can be viewed in a browser. Easy to set up when making use of Dynmap's integrated webserver which works out-of-the-box, while also available to be integrated into existing websites running on Apache and the like. Dynmap can render your worlds using different renderers, some suitable for performance, some for high detail. Components allow you to add/remove functionality to make Dynmap suit your needs. Using the components Dynmap comes supplied with, there is support for chat balloons, web-to-game chat, and configurable markers, areas, and lines. Chat messages are visible (as balloons or in a chatbox) on the map. Map viewers can chat to players in-game. Current Minecraft time is visible on the map. Current Minecraft weather is visible on the map. Overall highly configurable and customizable. Copy dynmap-*.jar into your plugins directory. If you are upgrading, delete the previous dynmap-*.jar - you do NOT need to delete the plugins/dynmap directory or its contents. If you are running a separate webserver (like Apache) you may need to copy the files from 'plugins/dynmap/web/' to a directory in your http-root and follow this guide. When upgrading, make sure you also upgrade the copied files. When you start CraftBukkit, you should be able to navigate to http://yourserverip:8123/ in your browser. In case you are running CraftBukkit on the PC you are currently working on, you can navigate to http://localhost:8123/. You should be able to see the players who are in-game. Note that the map is not yet rendered, therefore the background will be black. If you are planning on using the HD renderer, now would be a good time to do so. Enable 'deftemplatesuffix: hires' in the top of configuration.txt. More information about deftemplatesuffix is available at Base plugin settings. If you just want to see Dynmap work, use the following command in-game: /dynmap fullrender. The wiki contains more information about commands and permissions. The map should reveal itself gradually in the browser, give it some time. Progress messages indicate that Dynmap is working and will show when the render is completed. dynmap-mobs: Provides marker layer for real-time position of selected mobs on dynmap maps. Dynmap-CommandBook: Add support for showing /home and /warp locations defined using CommandBook. Dynmap-Essentials: Add support for showing /home and /warp locations defined using Essentials. Also, for the best response to questions and such, please post comments to our main forum thread - http://www.minecraftforum.net/topic/1543523-dynmap-dynamic-web-based-maps-for-minecraft/. Once again, having more than one place just isn't helpful, and this is where the 'Dynmap Community' already operates. Hey, Is there any way to turn off the requirement of a login on the webserver? How could I have it on my alternos server? got the full render done.. but cant find where i can get the page/site where i can get to the dynmap. it dosnt work when i try to search the up in the Google bar. please help! 20:18:09 [INFO] [dynmap] Loaded 25 shaders. 20:18:09 [INFO] [dynmap] Loaded 82 perspectives. 20:18:09 [INFO] [dynmap] Loaded 14 lightings. 20:18:10 [INFO] [dynmap] Loaded 3 maps of world 'SKE TV - Survie'. 20:18:10 [INFO] [dynmap] Loaded 2 maps of world 'SKE TV - Survie_nether'. 20:18:10 [INFO] [dynmap] Loaded 2 maps of world 'SKE TV - Survie_the_end'. 20:05:52 java.lang.IllegalArgumentException: Error initializing dynmap - bukkit version incompatible! dynmap pause is not working. Is it possible to set dynmap to never show more than just a specific area? I don't want my players to know every island and biome and how to get there, I want to keep some secrets so they can explore themselves instead of just opening the world map. I really like the map around the spawn area (we have a small island and its fully shown, that's nice), but I would love to set a maximum sight. Is that possible? Is it possible or can someone show me how to convert a large image into a dynmap map? Does exist a version of dynmap for bukkit server 1.13 ? So, the thing I find very annoying to Dynmap is that the tiles take up so much space. If you go for a file save, I understand it's necessary, but if you go for the SQL save, every tile is saved individually as a blob in the Tiles table, so if you have a few worlds the database gets enormous. Perhaps having just 1 table with all the blobs of all the tiles and then refer to the appropriate ID or the tilename in the Tiles table, I think it would save like 99%+ of the space which is currently used plus improve load time big time.. When I use the fullrender command I get an Internal Error message. I am running a Cauldron 1.7.10 modded server. Do I need the mod for Dynmap instead of the plugin? Any help would be great as I really need this plugin. Help! i get a completely different server than mine idk what to do! different than the default. Keep changing it till you find a free port. stay in 8100 -8200 is range. Make sure your ip is not the same as some other server by mistake? # The TCP-port the webserver will listen on. If it's your first time using it on your server. It would normally be black until the full render has completed itself upon starting it (by default). I'll quote two paragraphs, in case you may have missed that part. "If you are running a separate webserver (like Apache) you may need to copy the files from 'plugins/dynmap/web/' to a directory in your http-root and follow this guide. When upgrading, make sure you also upgrade the copied files." If you have correctly followed the steps provided. It should work after a while. If you still struggle, you may want to take some time and look at this tutorial. Nah I get the same issue. When I load the web server it says 'standalone/config.js' isnot a valid directory. i am trying to get some blocks to disapear on the map ! but when i try to start the server again it crashes. remove it of place a " # " in front of it and it works again. but i cannot seem to get the cloud blocks to go away. i have 3 extra dimentions, no matter what tip i follow it does not work ! the only thing happens when using the dmap delete command it that the dimention goes to the bottom of the row nothing more !